Newport Beach and Stockton, Calif. – CT has sold two newly-constructed industrial buildings at its NorCal Logistics Center in Stockton, Calif. to Prologis for $47 million. 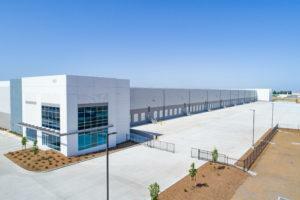 The two buildings total 575,127 square feet and mark the initial completion of CT’s three-building Phase I development of the larger 4.4 million-square-foot NorCal Logistics Center. Prologis (NYSE: PLD), the largest owner of industrial space in the U.S., paid approximately $82 per square foot for the buildings, which were unleased and in shell condition at closing. “In this case, the transaction allows Prologis to enjoy a fair profit on their investment going forward while providing CT with a sizable return and well ahead of schedule – a true win-win,” added Ewing. NorCal Logistics Center is home to General Mills, KeHE Foods, Allen Distributors and Fox Head, and is in the heart of California’s Central Valley, a 185 million-square-foot industrial market. The region is an extension of a global logistics supply chain infrastructure directly linked to West Coast ports in Oakland/Stockton, Los Angeles/Long Beach, Portland, Ore. and Seattle/Tacoma, Wash.
CT purchased the 345-acre industrial site for NorCal Logistics Center in May 2017 and has now completed the first phase development, including a third 1,122,341-square-foot building, one of the single largest speculative industrial buildings in Northern California. The second phase of development will begin toward the end of 2018 and include three buildings totaling approximately 1.6 million square feet of space. In addition, CT is in development on major logistics centers near Chicago, Atlanta and in the Dallas/Fort Worth Metroplex, where the company last month announced the development of Oakdale Logistics Center in Grand Prairie, TX. The company plans to announce three new development projects in the next few months, further extending its nationwide logistics footprint.